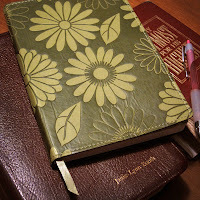 Janie kept journals that accompanied her daily quiet time and bible reading. Sometimes she wrote down her own thoughts, but mostly she wrote down bible verses that were very meaningful to her. She also jotted down quotes from people whose books really helped her. People like Oswald Chambers (My Utmost For His Highest), and L.B. Cowman (Streams In The desert) as well as hymn lyrics and so forth. She wrote these things down, especially toward the end, so she could get to them quickly when she felt the need for extra courage and strength. It buoyed her to have a good word that spoke directly to what she was feeling at the time. This is a good practice which I should probably do more of. One thing that I especially like about her writing these things down is that I can look back and see her handwriting which is so happily familiar to me, and read 'where she was at' on any given day. Which brings me to the upcoming series that I will be doing here on the blog. Thanks for doing this, Chris! I look forward to checking in every day.